Welcome to the homepage of E merging Z oonoses I nformation and P riority systems, EZIPs . 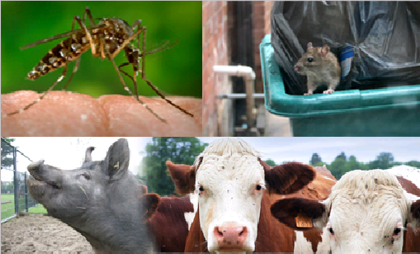 This website aims to assist Dutch decision makers to establish the priority of emerging zoonoses with respect to public health, as a basis for effective and efficient policy-making on control, prevention and surveillance. The information presented on this website provides scientific input for decision making by the Dutch Ministry of Public Health, Welfare and Sports and the Ministry of Economic Affairs, Agriculture and Innovation. Other aspects of importance for decision making, such as the effectiveness and efficiency of surveillance and control methods, and risk perception are not taken into account in the present version of the priority setting system. Zoonoses are diseases that are transmitted between vertebrate animals and man under natural conditions. These include zoonoses that are transmitted through a vector, but excludes vector borne infectious diseases, like Chikungunya and Dengue, which do not have a non-human vertebrate reservoir Van der Giessen et al, 2010 . An emerging zoonosis is defined as a zoonosis that is newly recognised or newly evolved, or that has occurred previously but shows an increase in incidence or expansion in geographic, host, or vector range Van der Giessen et al, 2010 . This website consists of a database of 86 emerging zoonotic pathogens in the Netherlands, prioritized according their scores on seven criteria of threat. Details on the method used for priority setting can be found in: Havelaar AH, Van Rosse F, Bucura C, Toetenel MA, Haagsma JA, Kurowicka D, Heesterbeek JAP, Speybroeck N, Langelaar MFM, Van der Giessen JWB, Cooke RM, Braks MAH. Prioritizing emerging zoonoses in the Netherlands, submitted for publication. Navigating to "Pathogens" leads to the database and clicking "Graph" shows graphically the prioritizing of emerging zoonoses in The Netherlands and gives the opportunity to adjust the settings.